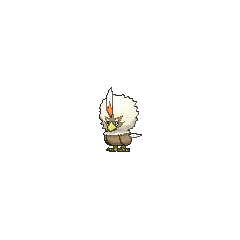 Rufflet in game: 11,219 Who? Important notice! Pokemon Rufflet is a fictional character of humans. Rufflet (Japanese: ???? Washibon) is a dual-type Normal/Flying Pokémon introduced in Generation V.
It evolves into Braviary starting at level 54. Rufflet is a small avian Pokémon with a blue body. A large white plume of feathers covers its head and three tail feathers extend from its lower back. The feathery ruff extends down past its neck, covering the upper third of its body. Its face is blue with five pointed tips, resembling a mask and crown in contrast to the white feathers surrounding it. Extending from its forehead is a large feather, which is red on the lower half and white on the upper half. The split between the two colors on the feather resembles a zigzag pattern. 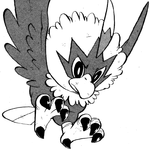 Rufflet's beak is short and wide, with large eyes on either side. Each eye has a thick black iris with a small white pupil. Its yellow legs and feet are large in comparison to the body. Each foot has four digits: one backwards, and three forwards. The thick, black talons on its feet are strong enough to break even the hardest of berries. Rufflet is extremely aggressive and knowingly provokes opponents larger and more powerful than itself. 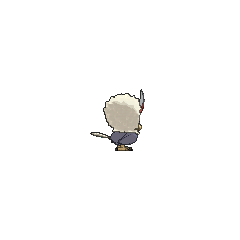 It sees this as a means of quickly getting stronger. Rufflet made its TV debut appearance in Unrest at the Nursery!. Rufflet made its debut appearance in White—Victini and Zekrom and Black—Victini and Reshiram. Two Trainers' Rufflet appeared in SM006. A Rufflet appeared in SM008. BW095 Rufflet Ash's Pokédex Rufflet, the Eaglet Pokémon. Rufflet's talons are powerful. Able to crack open even the toughest Berries. It often challenges stronger opponents to battle. As a child, Black caught Brav, his first caught Pokémon, when Brav was a Rufflet. Bianca agitated the Eaglet Pokémon by accidentally stepping on his food, and he attacked her. Black battles him with the help of Musha, who was then a wild Munna, until Black managed to catch him. They pick fights indiscriminately. They grow stronger and more powerful each time they faint or are injured. With its sharp claws, this Pokémon pierces its prey, and then it pecks at them. Although it also consumes berries, it's a carnivore at heart. Moves marked with a superscript game abbreviation can only be bred onto Rufflet in that game. For other sprites and images, please see Rufflet images on the Bulbagarden Archives. 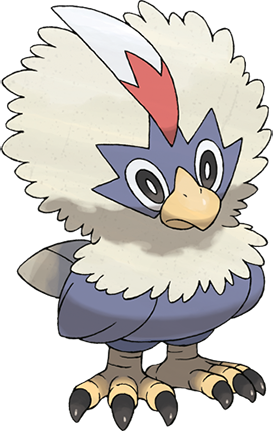 Rufflet, like Braviary, is based on the bald eagle, specifically a baby eaglet most likely, paralleling Rufflet's position as the start of its evolutionary line. Its color scheme is inspired by the red, white, and blue of the flag of the United States. 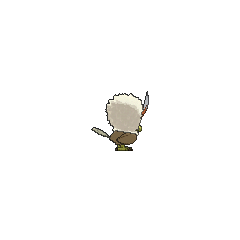 The single plume on his head also derives from Native American culture. Its ability to use its talons to crack open nuts and feed itself in the anime is similar to that of parrots, who are the only known bird species to do so. 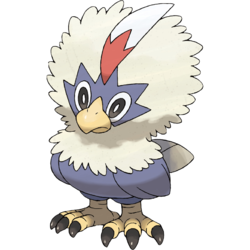 Rufflet may be a combination of rough, ruff, ruffle, or Ruff and eaglet (a young eagle). Washibon may be a combination of ? washi (eagle) and ? bon (boy, as a prefix or a nickname), ibon (Filipino for bird), or haribon (Philippine Eagle). Mandarin Chinese ???? / ???? Máotóuxiaoying Literally "Feather-headed eaglet"